After trademarking the leaf and patenting the rectangle, Apple has outdone itself by trademarking the shop. 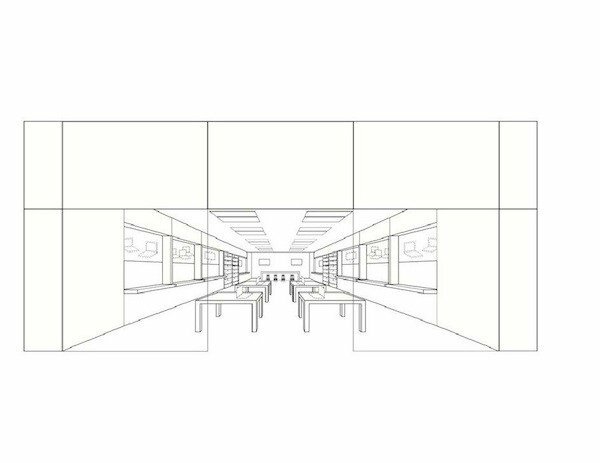 The US Patent and Trademark office last week granted Apple's application to trademark a retail store featuring computers. It is the "distinctive design and layout" that Apple now holds the unique design rights to, thanks to US Trademark 85036990. The application to exclusively own this particular store arrangement - specifically "rectangular tables arranged in a line" - was filed in December 2010 and granted on 22 January 2013. Rectangular tables arranged in a line in the middle of the store parallel to the walls and extending from the storefront to the back of the store. There is multi-tiered shelving along the side walls, and a oblong table with stools located at the back of the store, set below video screens flush mounted on the back wall. The placement of various items is considered part of the overall mark too.